Boston-based photographer David Hilliard has long involved friends, lovers, students and strangers in his arresting multi-panel tableaux. The collaboration most enduring, though, has been that with his father, Raymond. Raymond Hilliard has had, as David put it, “more than a casual interest” in photography. The family albums included thematic series such as “through the door” shots; annual photographs of David and his brother with trees planted in their honor; and multi-image landscapes that presage his son’s preferred presentation of photographs. So it is not surprising that Ray would be open to, perhaps even interested in, participating in his son’s creative endeavors—but the vulnerability he displays, and David elicits through the photographs, reveals the complexity of both men and of their relationship to one another. In “Feeding Gretchen,” 1993, one of the earliest published photographs of father and son together, one can interpret a familiar love triangle—David, left, stares intently at his father over takeout, while Ray only has eyes for the family dog, who gazes back at him with the simple and unconditional love only an animal can provide. 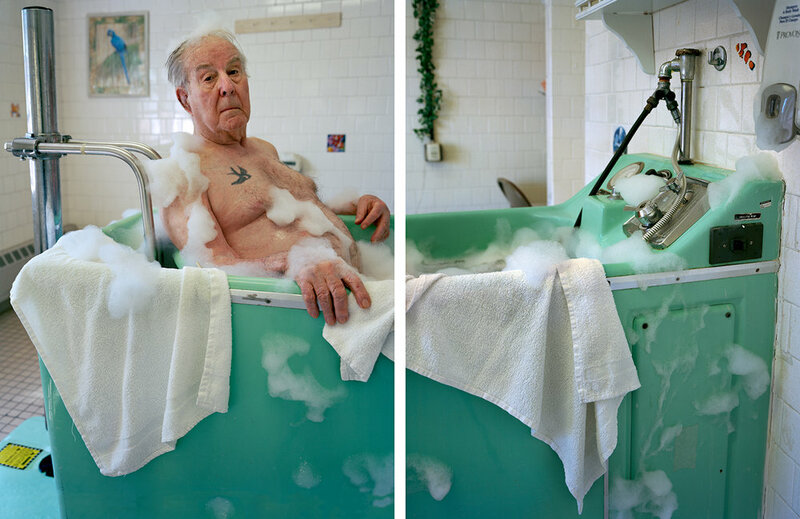 Hilliard’s work in the mid-1990s expanded under the tutelage of Philip Lorca DiCorcia, Gregory Crewdson, and others teaching in the MFA program at Yale, where he gained the “license to understand their medium as much more than a candid and ‘truthful’ form of observation.” Hilliard’s photographs, often drawn from lived circumstances, elevates what is experienced through what he then constructs—a little more perfect, a little more painful than the fleeting moment in time. Three works made over a decade later illuminate the intricacies of individual and generational traits. In “Blue Glow, 2004,” the duality of similar bodies with twinned tattoos sharing the same action pushes the viewer to examine details of difference—Ray’s gold watch and aged hand, the suggestive crop that reveals a little more belly, the curve toward the hip. Only faces immediately denote a difference in age. But in “Rock Bottom, 2008,” the physical and emotional distance is accentuated—Ray’s body in the foreground is soft, almost sagging into the water, whereas David, standing taller, appears agile and muscular not only above the surface but in the water. Where in “Blue Glow” David appeared to mirror Ray in nearly every way, he is now reflecting himself, with only the tattoos, a son’s homage to his father, as a visibly-shared trait. In “Hug,” made the same year, the distance perceived in “Rock Bottom” is eloquently collapsed in the embrace, though not entirely absent—only Ray’s face is visible. “Ringer” calls to mind an earlier work, “Handling Doubt.” David has often depicted Ray with his notes or craft projects; here he is holding a puzzle that is both simple in its intent, and challenging for anyone to achieve—not unlike life itself, as we simultaneously progress and decline. “Furniture Walker” possesses a trust and poignancy that will resonate with every adult responsible for care of an elder who once guided them through the earliest formations of humanhood. “The Decades” confronts the mysteries of mortality in anticipation of what will be. It appears as a memorial in advance—approaching the finality of death from a different vantage point, while both David and Ray still share this realm and have the opportunity to discuss ways of visualizing “the end” before the reality of its occurrence. In focusing on this singular but consistent collaboration within Hilliard’s body of work, we gain access to all the formal qualities for which David Hilliard has been celebrated, but also a window into one of the earliest and the most complex relationships any person unwillingly, unknowingly enters—that of a child to a parent. Through this work the Hilliards, son and father, offer up glimpses of the paths they have navigated together to foster what the photographic medium does so well—insight into our selves and our most formative familial interactions. Michelle Dunn Marsh, an advocate for significant photography and the printed page, is the founder of Minor Matters Books, and the executive director of Photographic Center Northwest.